Yesterday, our top 15 Google Science Fair finalists descended on Google’s headquarters and wowed our luminary judges—as well as more than 1,000 local attendees plus Googlers who stopped by to check out the action. Our exhibit hall was buzzing with energy and excitement as everyone wondered which young scientists would go home with our top prizes. Lauren Hodge in the 13-14 age group. Lauren studied the effect of different marinades on the level of potentially harmful carcinogens in grilled chicken. Naomi Shah in the 15-16 age group. Naomi endeavored to prove that making changes to indoor environments that improve indoor air quality can reduce people’s reliance on asthma medications. Shree Bose in the 17-18 age group. Shree discovered a way to improve ovarian cancer treatment for patients when they have built up a resistance to certain chemotherapy drugs. We also awarded one Grand Prize and the Grand Prize Winner is...Shree Bose; congratulations! Our judges said the unifying elements of all three young women were their intellectual curiosity, their tenaciousness and their ambition to use science to find solutions to big problems. They examined complex problems and found both simple solutions that can be implemented by the general public—like changing your cooking habits or removing toxins from your home—as well as more complex solutions that can be addressed in labs by doctors and researchers, such as Shree’s groundbreaking discovery, which could have wider implications for cancer research. The winners took home prizes furnished by Google and our partners CERN, LEGO and National Geographic. Shree received a $50,000 scholarship, a trip to the Galápagos Islands with a National Geographic Explorer and aninternship at CERN. 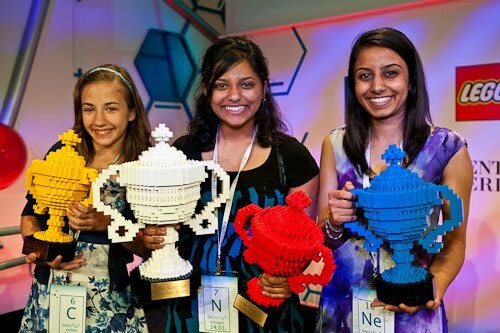 Naomi and Lauren each received $25,000 scholarships and internships at Google and LEGO. All three were awarded lifetime digital subscriptions to Scientific American. Beyond the grand prizes, everyone went home with some pretty cool loot, along with plenty of photos and memories that we hope will last a lifetime. If you’d like to watch last night’s events, including a speech from our chairman, Eric Schmidt, and presentations from judges Dean Kamen and Tierney Thys, you can find video on our YouTube channel. On behalf of Google, our partners and science lovers everywhere, we’d like to thank all of our finalists and everyone who submitted a project to the inaugural Google Science Fair. We are humbled by your ingenuity, your dedication and your skill. We are heartened to know that our future is in the capable hands of our young scientists—young men and women who tackle big ideas to bring significant, actionable change to the world. If you’d like information about next year’s Google Science Fair, let us know and we’ll be in touch soon, or keep an eye on the Google Science Fair site for regular updates.